Cobblestone is an active lifestyle community developed in Palmer Ranch under the signature Esplanade brand of national builder Taylor Morrison. This development is located on a parcel of about 70 acres just west of the McIntosh Road–Sawyer Loop junction. It is also directly adjacent east of the established communities of Marbella and Mira Lago which both often have listings of pre-owned Palmer Ranch homes for sale. In contrast with its older neighbors, the market offerings at Cobblestone on Palmer Ranch are all of new construction. Taylor Morrison started in 2015 the development and marketing of this community which it deftly set for 180 single family homes. A gated enclave, Cobblestone flaunts all the lifestyle trappings common to all the Esplanade communities of the Scottsdale, Arizona-based developer. 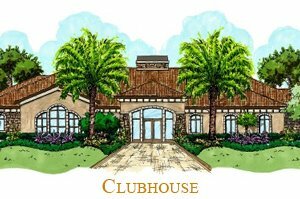 Leisure activities in this community revolve around its well-appointed clubhouse which hosts plenty of socials and outings coordinated by a full-time lifestyle director. Besides its gathering rooms and catering kitchen for social functions, this community center also features a fitness center with state-of-the-art equipment. Outdoor delights are provided as well, with Cobblestone having a luxurious resort-style pool, a community park, pickleball and bocce ball courts, and a dog park. Trademark to this Esplanade community too is its striking gated entrance with the inspiration of its detailing drawn from the California Tuscan architectural style. Cobblestone homes for sale likewise derive much of their appeal from the property’s exquisite landscaping of natural wetlands and lakes which serve as a backdrop for these residences. Cobblestone homes for sale are built under Taylor Morrison’s high quality standards in residential design and construction practices. The builder makes available in this community some of its most popular home models, upgrades and ornamental details. 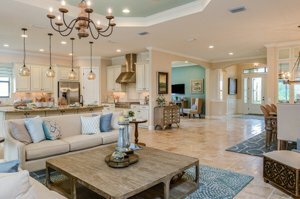 Through its design studio in Sarasota, this homebuilder can tailor-fit the homes’ finish on such items as lighting and flooring to the specifications of the buyer. The Mediterranean architecture comes as the central theme of the homes for sale in Cobblestone on Palmer Ranch, which are available in nine floor plan designs. These residences feature floor areas starting from 1,689 up to 3,100 square feet, designed with two to three bedrooms. The price points of sales listings in this community are between the $400s and the $700s. Other factors which could enhance market interest on Cobblestone homes for sale is its proximity to several popular area amenities. Just south of this Taylor Morrison community is TPC Prestancia which offers attractive selections of golf and country club membership. 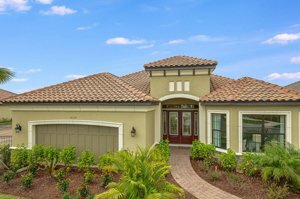 Cobblestone is likewise conveniently close to public recreational facilities like the Legacy Trail which extends from Sarasota southward to Venice. The corridor of Clark Road north of this community extends westward to Stickney Point Road which is the gateway to the pristine beaches of Siesta Key. Shopping and dining outlets are within easy reach too at the Sarasota Pavilion anchored on a Publix Supermarket on Stickney Point Road. Even nearer south, the Westfield Sarasota Square Mall hosts retail shops and restaurants that further broaden the lifestyle choices for those living in Cobblestone on Palmer Ranch. Below are the current real estate listings available at Cobblestone on Palmer Ranch.